"A few years ago I saw this amazing tutorial from Sarah Hearts. She made a little basket out of a paper plate and washi tape, and I love that with something so simple you can construct something so functional and perfect for gifting little food items. Although you could use it for many things, she showed it with berries, and I think of it as a berry basket, much like those you would get fresh berries in. 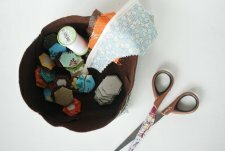 "The construction of Sarah's basket is so easy that I just had to steal, er...borrow it for a longer lasting mini work basket. 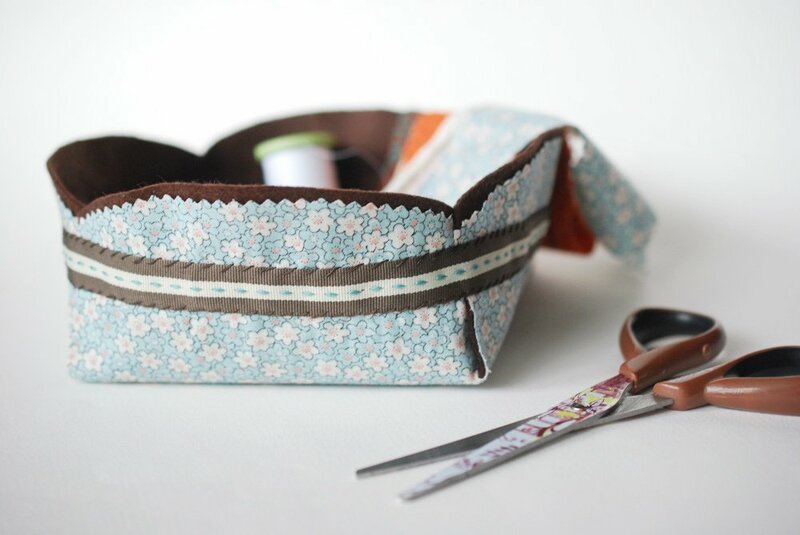 By using fabric and felt in place of the plate, and ribbon in place of the tape, you have a berry basket that is perfect for holding your hexagon work, keys and loose change, or even to hold a little gift. "You can alter the size to whatever you want, really. Just use different sizes of plates and square base templates. Just be aware that as you make these larger, they will get a bit more floppy. Hey! That just adds to the charm!"